U.S. News and World Report recently rated medical secretary careers as one of the best healthcare support jobs. Those who are medical secretaries work well into their 60s, which shows you that you’re thinking about a highly satisfying career choice. Because the territory of being a medical secretary comes with a great work-life balance, you’ll be able to enjoy all aspects of your life without the pressures of a highly stressful job. Find a medical secretary school near you. Who runs the office? Medical secretaries run the office! They hold down the fort that is the medical practice. They are the glue that holds things together when it comes to the health industries administrative and supportive duties. 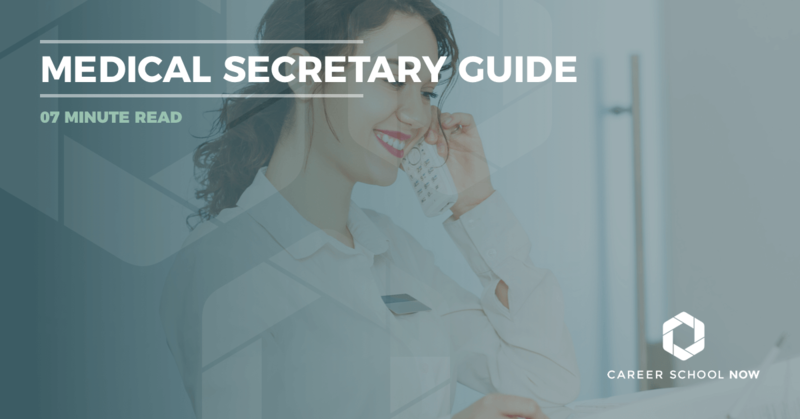 Not only do medical secretaries know the ins and outs of their own job details, but also they have major working knowledge of medical terminology, medical procedures, and business practices. They are fully aware of everything that goes on inside their employers’ medical practices. Since they are talking to patients and medical staff all day—and are usually the first person you’ll see when walking into a medical facility—they become the link between patient and physician. Their job is primarily office related, and they work in places like hospitals, private practices, labs, pharmaceutical companies, health insurance companies, and anywhere within the industry that a medical secretary is a necessity. You aren’t sure you have the skills or temperament to work as a medical secretary, right? Some of the necessary talents will be taught to you, while others are innate. However, if you are lacking in any of the areas, don’t fret; very often, they can be learned behavior. In other words, you can fake it till you make it. If being a medical secretary is what you want to do, then you’ll do whatever it takes to achieve it. Organizational skills are important. You’re in charge of all the files and, in many instances, there are a massive amount of them. Have a warm and sunny disposition. You are the first face patients see, so you set the tone of their visit. Communication skills are imperative. Know how to talk to patients and medical staff. Pay attention to details; there are a lot of them in your line of work. Take privacy seriously. You can’t be a gossip. Have the backs of others in the office; you’re the go-to person for team support. Stay on top of what is going on. You’re going to have to be the deadline dominator. Keep calm and medical secretary on, even when others are stressing out. Work well independently, but be a good team member too. Enjoy research. You will always need to learn new things. If you aren’t a fan now, just think about how much smarter it will make you feel once you’re done. Be good with computers. Actually, be so great with computers that it’s almost like you are one. So, after looking at the duties and inspecting the qualities, you think that becoming a medical secretary is the perfect way to go for you. First of all, you need to have either your high school diploma or GED prior to starting your medical secretary training program. Also, it’s a good idea to spend a couple days shadowing a medical secretary. You can get an idea of what’s in store for the future you. Find a medical secretary school near you. Trade schools and community colleges have two-year certificate programs for the medical secretary track. Some employers will provide on-the-job training but the formal education, combined with the right certifications, are pretty important for any future jobs with a larger paycheck. In your medical training program, you’ll learn about business communication, medical terminology, anatomy, insurance claims, transcription, and database management. Many of the programs offered in trade and college have the same-ish curriculum, but the class titles may be different. There are decent online medical secretary programs available. Of course, you can mix it up a bit too. Take some online, and some in class. Either way you choose, the curriculum is pretty standard, so you really can’t go wrong. Do what’s convenient; it’s going to take discipline regardless, because you have to attend and pass your courses. Professional organizations offer certifications for medical secretaries. Just as a side note, if there are certifications offered for your field, it’s usually a good idea to go after them. It makes you more hireable, and you could see a bigger salary from it as well. Some certifications available are through International Association of Administrative Professionals (IAAP), which offers the Certified Administrative Professional certification.The American Association of Medical Assistants is where you can earn the Certified Medical Assistant designation, which will add another facet to your skill set. According to the Bureau of Labor Statistics, secretaries and administrative jobs are going to experience extremely slow growth over the next few years. However, when it comes to medical secretaries, it’s looking very sunny with a 22 percent growth. When the average job outlook is between five to seven percent, this number is astronomical. Medical secretary jobs are dependent on how well the medical industry is doing. And because there are so many more Americans with access to healthcare, that’s the factor accounting for this outlook in jobs. Medical secretaries have pretty standard 9-5 jobs, with very few weekend and evening hours if they work in a private medical practice or clinic. The average medical secretary salary is $33,730. Entry-level salary is in the $23K range, while those in the top 10% of the profession will make closer to an average of $50K. Of course, salary can look very different depending on where you live and which section of the medical industry you’re in. Your career as a medical secretary easily lends itself to a couple of other options that are related to the medical field. Some medical secretaries decide to go into medical records and health information, which has a really great job outlook and a median salary of over $40K. Another option is medical assisting; this career will combine both clinical and administrative duties.